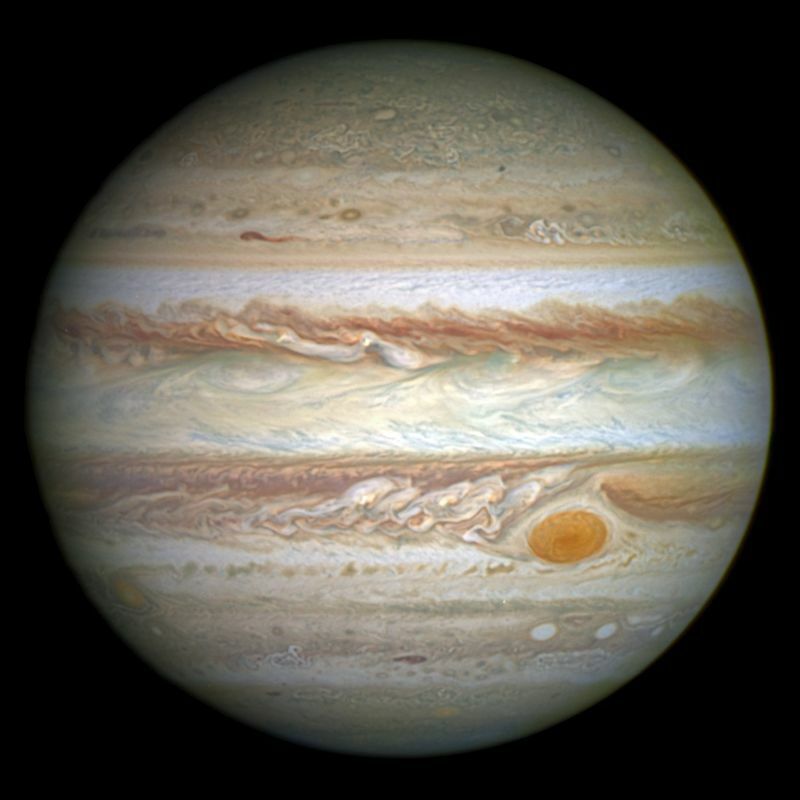 On May 9 the planet Jupiter will be what is known as ‘at opposition’. This event, which occurs every 399 days, happens when Jupiter is at its closest to the Earth and at its brightest. To the naked eye it will be a brilliant white object, three times brighter than the brightest star. Features such as coloured bands and the famous great red spot can easily be seen with a small telescope. The series of diagrams below show Jupiter and Earth at different points in their orbits around the Sun. The Earth takes just over 365 days to complete an orbit. Jupiter, which is further away from the Sun and moves more slowly in its orbit, takes nearly 12 years. 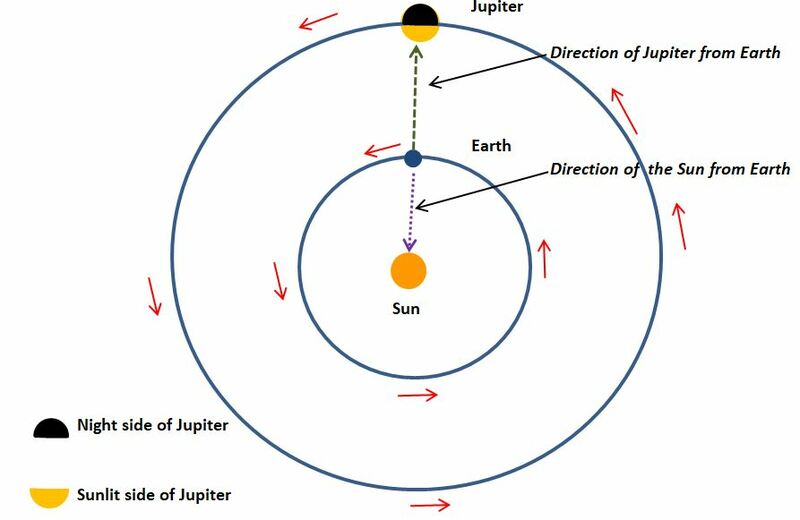 In the first diagram, below, Jupiter is at its closest point to the Earth As seen from Earth, Jupiter is in the opposite direction from the Sun. This is why it is called opposition. All night between sunset and sunrise, Jupiter is above the horizon and it reaches its highest point in the sky in the middle of the night. Jupiter is at its brightest at opposition because it is at its closest to Earth and the entire sunlit side is facing Earth. 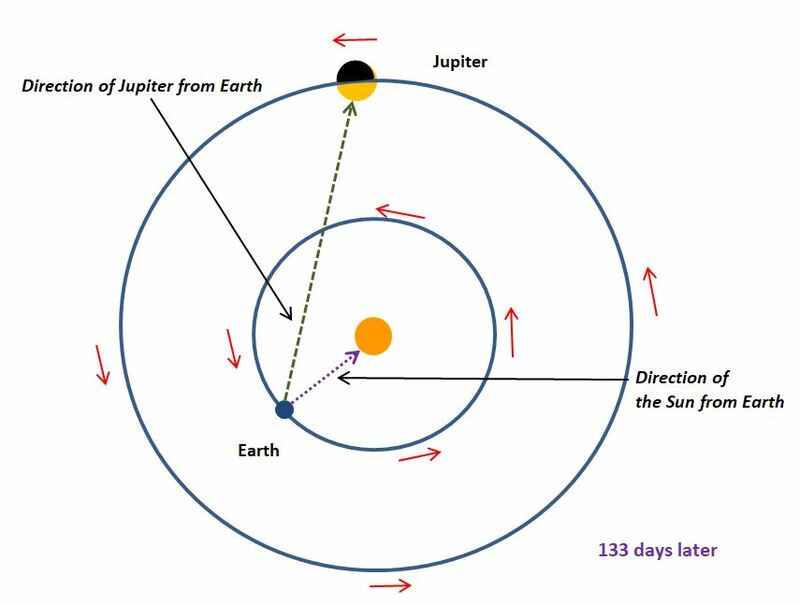 In the diagram below, 133 days later, the Earth has completed more than one-third of its journey around the Sun, whereas Jupiter has done less than 3%. Jupiter appears less bright because it is further away from Earth and not all the sunlit side of Jupiter is facing us. In addition, Jupiter appears fairly close to the Sun and for most of the time is only above the horizon during the daytime, when it is very difficult to see against the brightness of the daytime sky. 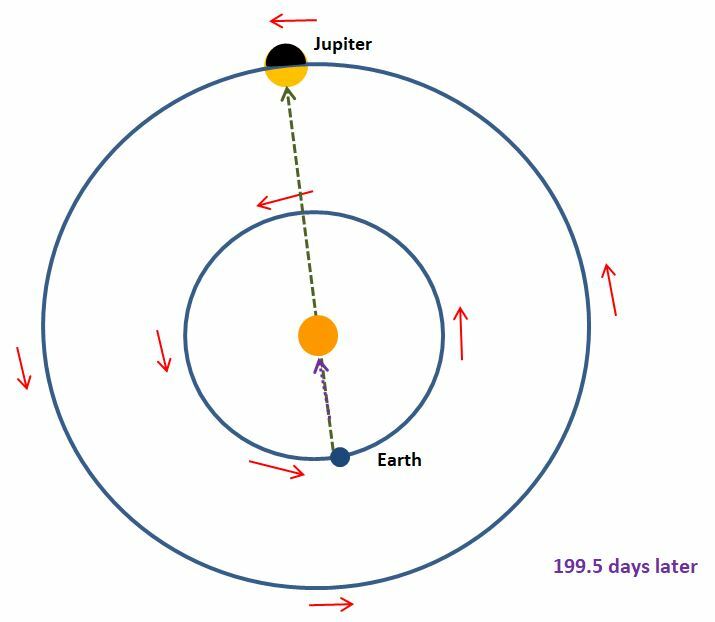 199.5 days later the Earth has completed more than half its journey around the Sun, whereas Jupiter has done just over 4.6%. At this point, which is known as a conjunction of Jupiter and the Sun, Jupiter is only above the horizon in the daytime and is impossible for an amateur astronomer to see without specialist equipment, because it is so close to the Sun. 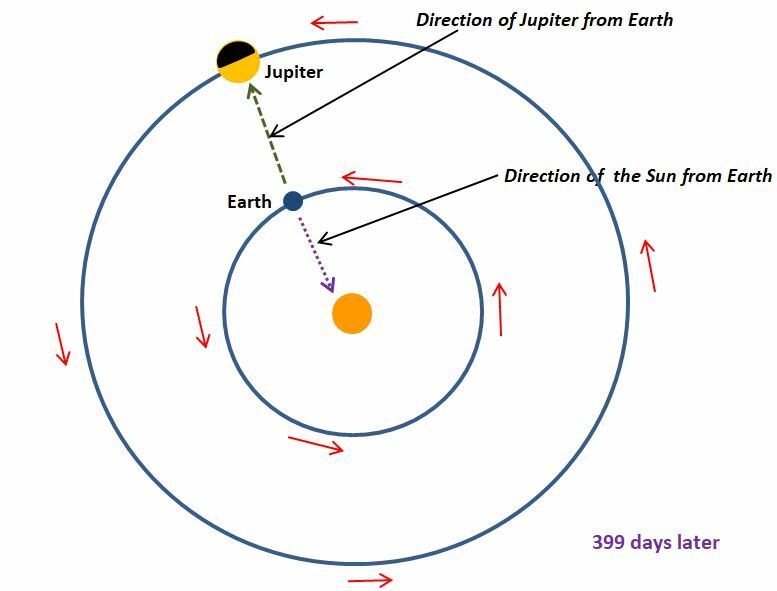 399 days later, the Earth has caught up with Jupiter, so the two are level again in their orbits. Jupiter is once again at opposition. How bright is Jupiter at opposition? When discussing the brightness of objects in the sky, astronomers use a scale called magnitude, where the lower the magnitude the brighter the object. The scale was invented by the ancient Greek astronomers who classified all the stars visible to the naked eye into six magnitudes. The brightest stars were said to be of magnitude 1, whereas the faintest were of magnitude 6, which is the limit of human visual perception (without the aid of a telescope). Today, the magnitude scale is applied to all objects in the sky, not just stars, and the magnitude of the very brightest objects is less than zero. The brightest objects in the sky are (obviously) the Sun, which has a magnitude of -26.7, followed by the Moon, which has a magnitude of -12.7, at a typical full Moon. a star of magnitude 1 is 15.9 times brighter than a star of magnitude 4. This is because 2.512 x 2.512 x 2.512 = 15.9. Jupiter moves in an elliptical orbit around the Sun; this means that its closest distance to Earth is different at each opposition. Therefore, as shown below, the brightness at each opposition will vary as well. 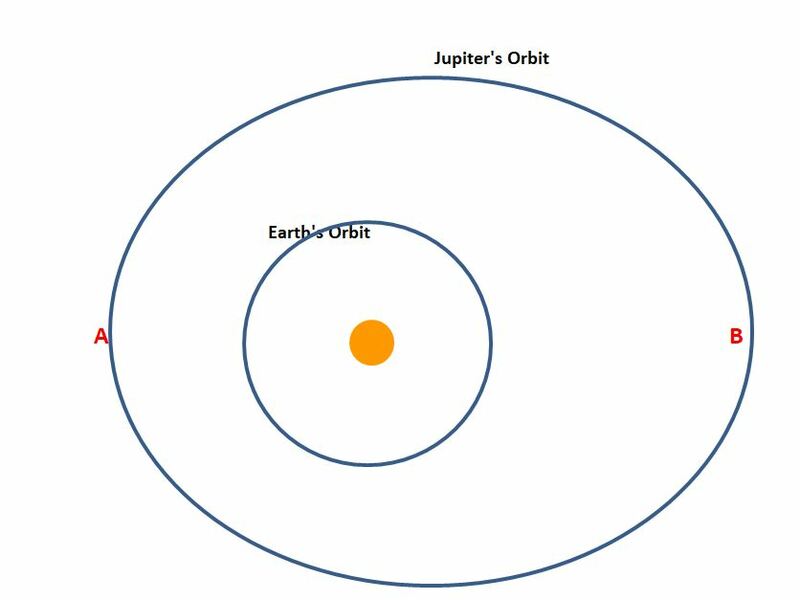 The diagram above shows that if an opposition occurs where Jupiter is closest to the Sun (point A,) Jupiter will also be closest to the Earth and thus brighter than an opposition which occurs where Jupiter is furthest from the Sun (point B) . In the diagram the elongation of Jupiter’s orbit has been exaggerated. The closest Jupiter can get to Earth is 589 million km; when this happens it shines with a magnitude of -2.9. On the May 9 opposition, it will be 658 million km from Earth and will shine with a magnitude of -2.5, making it three times more luminous than the brightest star Sirius, which has a magnitude of -1.4. 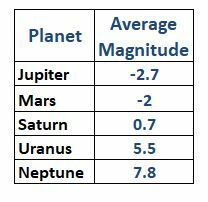 For comparison, the table below shows the average magnitude at opposition of the planets which lie outside the Earth’s orbit. How Does the brightness of Jupiter compare to Venus? For the two inner planets Venus and Mercury, the situation is a little different. They can never be at opposition because they lie inside the Earth’s orbit. 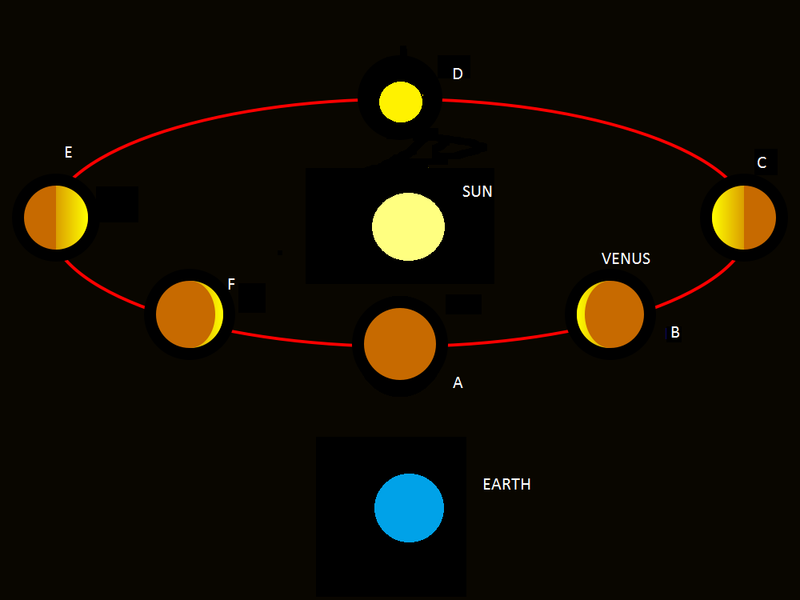 This is shown in the diagram below for Venus. As Venus orbits the Earth it goes through phases, similar to those of the Moon. However, because Venus is so small, they are only visible through a telescope. When Venus is closest to the Earth, the point known as its inferior conjunction – labelled A in the diagram – it is almost impossible to see because it is almost in a direct line of sight with the Sun and its sunlit side is facing away from Earth. Venus is actually at its brightest just before and just after inferior conjunction, points B and F, when it has a magnitude of around -4.5. Although Venus appears brighter than Jupiter, unlike Jupiter it is never above the horizon all night. At point B it is only clearly visible for few hours before sunrise where it is known as the Morning Star. At point F it is only visible for a few hours after sunset where it is known as the Evening Star. As nearly all my readers will know, Jupiter is the largest planet in the Solar System. Its diameter is on average 140,000 km which is roughly 11 times that of the Earth, making its volume 1320 times larger (Williams 2017). It is its large size which causes Jupiter to appear brighter than Mars despite it being more than three times further from the Sun. Unlike the smaller inner planets (Mercury, Venus, Earth and Mars) which have large iron cores surrounded by rocky materials, Jupiter is mainly composed of gas. It is not known if it has a solid core, but if one exists it will only make up a small proportion of the planet. Being made up of largely of gas means that its density is only 25% that of the Earth. Even so, its mass is still 320 times greater, making it more massive than all the other planets, moons, asteroids and comets in the Solar System put together. So far nine unmanned spacecraft have visited Jupiter. The first was Pioneer 10 in 1973 shown below. This was followed by Pioneer 11 (1974), Voyager 1 and Voyager 2 (both 1979), Ulysses (1992), Galileo – which went into orbit around Jupiter between 1995 and 2003, Cassini (2000) and New Horizons (2007). The latest mission Juno (shown below) arrived in 2016 and is currently orbiting the planet studying its atmosphere, magnetic and gravitational fields. 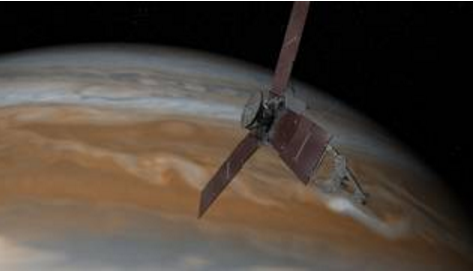 For more details on the Juno mission see my post Mission Juno. Jupiter has its own mini “solar system” of over 60 moons in orbit around it. The four largest moons were discovered by Galileo in 1610 and one of them, Ganymede, the largest moon in the solar system, is bigger than the planet Mercury. The innermost moon Io is the most volcanically active object known to exist anywhere. Europa, the second innermost, is of particular interest because its surface is composed of ice underneath which are thought to lie oceans of liquid water, warmed by a process called tidal friction. Many scientists think that Europa is one of the most promising places in the Solar System to find extraterrestrial life. NASA and the European Space Agency (ESA) are developing missions to Jupiter’s moons, will tell us a lot more about them . The ESA mission is called (JUICE) which stands for JUpiter ICy moon Explorer and the NASA mission is called Europa Clipper. Both missions are scheduled for launch in 2022. I hope you’ve enjoyed this post and that you will have a clear night on the daysaround 9 May to see this sight. Williams, D. R. (2017) Jupiter Fact Sheet, Available at:http://nssdc.gsfc.nasa.gov/planetary/factsheet/jupiterfact.html (Accessed: 28 April 2018). Another very interesting and readable article! Nice discussion. I have always found that the ability to visualize the geometry of the solar system – planetary alignments but also the backdrop of stars and in particular the Zodiac as our window changes through the year – help us understand what’s going on out there!